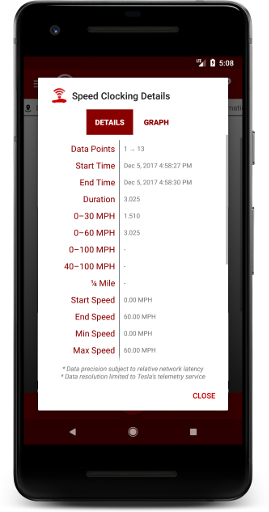 For precise, short term data collection and analysis purposes, Dashboard for Tesla offers real-time data logging with the feature, Speed Clocking, using the data collection scenario. The recorded data is only ever stored locally on your device and can be graphically analyzed and the raw data exported right from within the app. This is geared for users who want to test performance or track vehicle data very precisely over short periods of time (minutes). 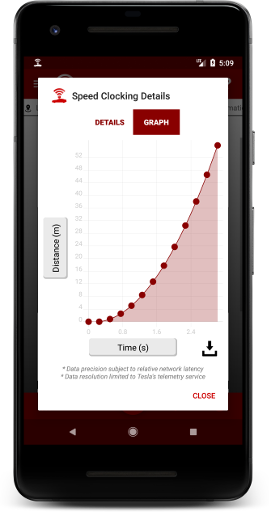 For more granular, long term, automated data logging purposes I recommend the service, TeslaFi.com. For a small recurring fee it offers around-the-clock data recording to a hosted database with vehicle location mapping time lapse and various granular vehicle metrics storing all data. This is geared for users wanting to track vehicle data over the long term, such as for business mileage reporting purposes.